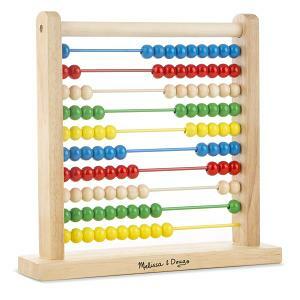 With the Play Money Set, develop basic math skills. Money games are fun and they can help children practice basic math by counting, adding and subtracting the money. The Melissa & Doug's Play Money Set is probably one of the best money sets in the market! It can be used for various pretend play games (for example: play grocery store). 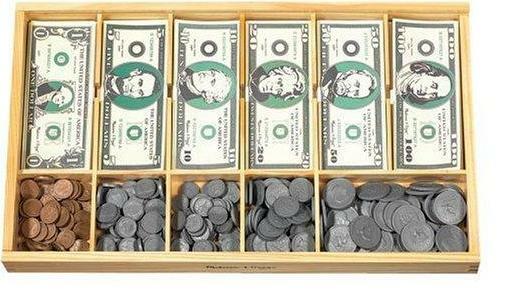 It features realistic pretend bills and coins, and a wooden cash drawer. This money set is designed for children ages 3 to 6. Children develop creative skills as they pretend play. They have to imagine a game such as being a cashier at a grocery store or a shop owner selling stuff (such as stuff found at home). Therefore, the game helps children become creative and work on their imagination. Children also develop basic math skills as they have to count the money and there is quite a lot of money to count! They add and subtract as they buy an imaginary product or make change. Because there are so many bills and coins, there can be a lot of counting involved and making change can become quite complicated. Children become better at adding and subtracting numbers without realizing it. What we like about this money set is that the bills range from $1 to $100 including single dollar bills, five dollar bills, twenty dollar bills, fifty dollar bills, quarters, dimes, nickels and even pennies! The bills and coins are realistic. Actually both the bills and coins are the same size as real US bills / coins. Some adults have even used the set to train their employees as the play money looks so realistic. The wooden storage box also looks great and most importantly, it is reliable. Overall, a highly recommend play money set. We also recommend other money games such as the Buy It Right Game, the Cash Register Toy and Monopoly. All of these games are a great way for children ages 3-8 to practice counting, addition and subtraction all while having fun. That’s the magic of money games.